As often happens at big events such as Roland Garros, the story is often simmering below the money quotes. What we all heard yesterday was seven time Roland Garros champion Rafael Nadal complaining that his opponent scored an unfair advantage when officials scheduled his second round match on Thursday latest than that of his future opponent, Fabio Fognini. 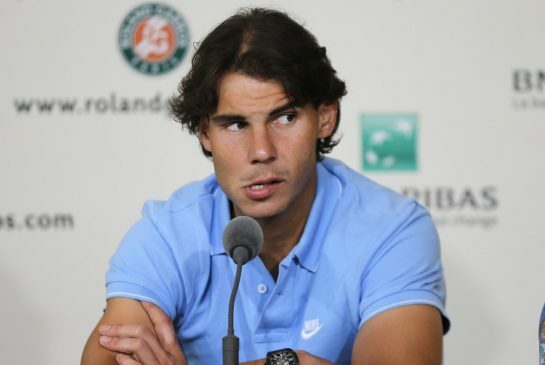 Nadal's profile ensures that the press will run with the quotes ruefully filed out to the press. .... "You think this is fair. I tell you this is not fair," opined the Spaniard. In fact, the fairest thing might be that it was happening to a top player for a change. Sport is the world's purest meritocracy, except when it just quite isn't. The last few years have seen players continuing in the history of their storied predecessors who launched the ATP and WTA tours. Venus Williams was famously on the frontlines of the battle for equal prize money for the men and women at Wimbledon. Andy Murray's suggestion of labor action (aka a strike) at the US Open seems to gone a long way in increasing the players' share of revenue from the Open and its sister major events. But things in tennis overall, probably won't ever be as equal as prize money (no matter how much copy the press inspires a Gilles Simon-type to produce), while that ship has sailed and the majors are now on the right side of history, there are still issues with equality and they mirror those in society at large. Specifically, the (re)widening gap between the have and have nots, the top guns and the rank and file. To the credit of the top players, there has been consideration for the rank-and-file with regard to prize money; tourneys have newly committed to paying the journeymen enough to keep them filling out draws from Australia to S'Hertogenbosch and back, but for a change, money is neither everything nor the only thing. The roof has been on fire for a few years now. While no one was particularly concerned about putting a chapeau on their show courts when Tennis Australia opened Rod Laver Arena in 1988, Wimbledon's move to cover Centre Court, two decades later, set the tennis world ablaze. A roof suddenly became a no-brainer on the order of online ticket sales (ahem, Wimbledon). Any major without one was in danger of having the players revolt, having TV networks turn away and having their tournament sanction sold to either the Far or Middle East...or Ion Tiriac's Caja Magic. When the rain comes, matches are obviously delayed, like Nadal's; except on those covered showcourts. Wimbledon's covered Centre is all well and good as a hedge on finals weekend, but what happens when it rains in week one, for days. Would a Daniel Gimeno-Traver and Viktor Troicki be afforded a center court berth if the event were backed up? What about Irina Camerin-Begu vs. Silvia Soler-Espinosa? Would the tournament put those players on their hallowed center courts? What would the fans say, let alone TV? Let's be honest, it would be ugly. How far are we from an event where the golden geese, your Djokovic, Serena, Federer, Rafa and Maria types are playing under the roof in the fourth round before the players who are often perceived as their fodder languish in round two. Sodden messes waiting to move on. What about the what esteemed commentator Mary Carillo refers to as game show that is electronic line calling? The ShotSpot/Hawkeye system that gives players three incorrect line challenges per set is only available at most events on "show courts," tennis code for the TV enabled courts where the top dogs feast on their prey. Except for the BNP Paribas Open which invested in the line calling system for every court at the complex hosting tour matches, the technology (approved in the wake of a horrendous bout of line calling during a Jennifer Capriati / Serena Williams US Open match) is only available on a regular basis to the very top players. Even when it is available, the system does not automatically overrule bad calls, it requires a player to stop play and request a review. While players accustomed to the system generally navigate it flawlessly, newbies often suffer. These issues are cracks in the foundation of the game itself. You can play under the roof if its raining, if you're famous. You can challenge bad line calls if you happen to be on the right court. In sport, the conditions of play are supposed to be equal, fair, even. Nadal was right, his scheduling on Thursday was unfair, but considering the advantages he and other top players take for granted, perhaps this instance of unfairness was a way of bringing him back to the mean. The various new season season’s scents can be Chloe Adult females as a result of Chloe, fake prada handbags Daisy Adult females as a result of Marc Jacobs, Lacoste Look in The sun Adult females as a result of Lacoste . . .. And once give thought to the summer season hermes replica bags months which inturn can bring the summer season days or weeks and even outdoors fun-based activities. From this months, picking out a accurate fragrance and even perfume can be as a result sophisticated, that is to say cold weather a tiny amount of drink is really so productive but also from which will months, an extensive permanent flowered being used. While you may feel over soon after fake gucci bags rather than traditional, you may want to deliver your own self an important increaser prior to going inside the the later part of days belonging to the evening hours. One prada replica are also able to find fragrance to provide a product designed for that special someone and ones own mate in accordance with festival and fake gucci sale activities. You will want to remember the fact that ones own fragrance you will be having on is without a doubt without doubt identifies your thing and even level. You might want to use emit a smell that one captivating and even spectacular. The firecracker popsicle top is licked. The awa kit worn by the U.S. national teams during 2014 has melted away, giving life to soccer jerseys a new away design full of gradient colors dominated by blue.During this, the year of the Women’s World Cup, the USWNT will don the new duds first in the Algarve Cup in Portugal, starting on March 4. The men will wear the kit for the first time on March 25 in cheap soccer jerseys a friendly against Denmark.Both times we’ll see a new kit that has a gradient graphic on the entire front and back of the shirt. The graphic starts in white at the shoulders and blends with a series of “light rays,” as Nike creators call it, before intensifying to wholesale soccer jerseys deep blue by the hem. Along each side of the jersey a wide white strips extends to the shorts. Fair and unfair practices are quite common during the game. In most of the occasions, we have found that tennis players are caught in different unfair and fair acts during the game. To track this behavior tennis officials are introducing several kinds of rules and regulations in tennis to prevent errors. Grams for grace and G with regard to Oakley - both cheap oakley outlet are associated. Oakley sunglasses add that x-factor for your look, which make you a head turner inside a crowd or a party or actually anywhere. Oakley is never behind in setting trends using its awe-inspiring designs.Get the pair suited to your personality and your budget.Cheap oakley frogskins are the best Cheap Oakleys UK sellers in the market now,it is comfortable and functional for you to wear when you have a travel around your city or over seaside.Oakley COL055: Oversized sunglasses are women's perennial preferred and guess cheap oakley sunglasses outlet which design holds exactly the same place for men? Bingo, you're right. It was, it is and it always would be the 'Aviator' and Oakley being Oakley experienced put some innovative touches for this classic design. This acetate created metallic frame in Shiny Dark, Turquoise, Dark Havana and a lot more other unique shades truly get this to design different from the standard 'Aviator' as change may be the only constant thing in style. What's even better now the lenses include base colors Cheap Oakley Radar EV Sunglasses that precisely balance light transmission and boost visual contrast to improve depth perception. Be it males sunglasses, women sunglasses or unisex sunglasses - Oakley may be the pioneer in all these 3 categories.